Land Cruiser V8. Experience the difference. The legendary Land Cruiser V8 has been further refined and reinforced. It ensures robust build and durability as it tackles the most challenging deserts tracks and mountain ranges for more than 60 years. 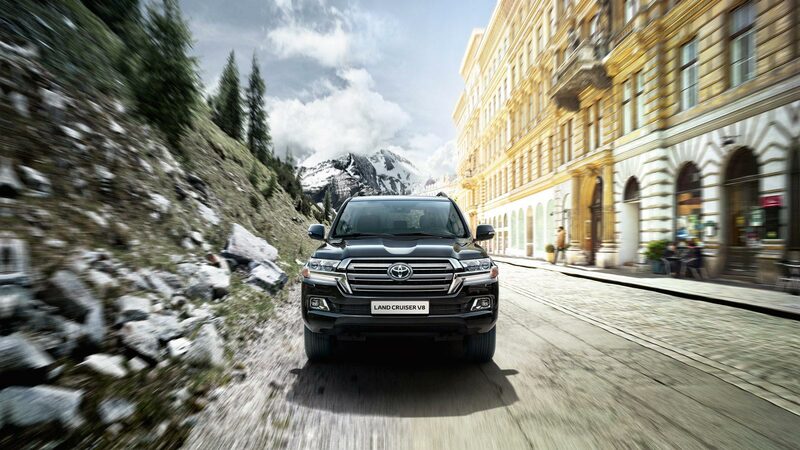 With a striking design, luxurious interior and improved capabilities, the Land Cruiser is the ultimate 4x4. The legendary Land Cruiser V8 ensures robust build and durability as it tackles the most challenging deserts tracks and mountain ranges. With a striking design, luxurious interior and improved capabilities, the Land Cruiser is the ultimate 4x4. Take a look at the range, which Land Cruiser V8 is right for you? The Land Cruiser’s robust build and durability has tackled on the most challenging desert tracks and mountain ranges. But the Land Cruiser is not just about tough protection, it offers a comfortable, peaceful drive thanks to sound-absorbing and noise-cancelling materials. The new Toyota Land Cruiser helps you overcome the most gruelling obstacles: the refined Multi-Terrain Monitor gives you eagle eyes of your surroundings, while a display of the steering angle provides handy assistance. The Multi - Terrain Select allows you to tackle off-road surfaces. The exterior design of the Land Cruiser celebrates genuine strength, exceptional functionality and refined comfort in equal measures. The carefully considered interior creates an instantly luxurious atmosphere. In the Land Cruiser, luxury has never felt more confident. Multi-Terrain Monitor (MTM) MTM allows you to see the road around you, helping you stay on your intended course and avoid potential danger. The screen displays a choice of six live images from four exterior cameras. By simply pressing the multi-function switch on the steering wheel, you’ll have an instant understanding of your surroundings. Multi-Terrain Select (MTS) Tackle any situation with a choice of five terrain modes – ‘Rock’, ‘Rock & dirt’, ‘Mogul’, ‘Loose rock’ or ‘Mud & sand’. The vehicle’s throttle, braking and traction control systems are automatically modified to suit the off-road conditions, providing maximum traction and control. Off-road Turn Assist The Off-road Turn Assist function enhances drivability on tight corners. The turning performance is enhanced in accordance with the driver’s steering wheel operation, while maintaining a constant low speed, thus reducing the number of 3-point turns. Body on Frame High tension sheet metal is used to maintain a lightweight design and ensure strength and rigidity. Sound-absorbing and noise-cancelling materials contribute to a peaceful drive. Active Height Control (AHC) and Adaptive Variable Suspension (AVS) AHC adjusts your vehicle's ground clearance to provide optimal vehicle performance, regardless of speed or terrain. Together with AVS it also makes your vehicle more stable and comfortable. Kinetic Dynamic Suspension System (KDSS) KDSS is an electronically modulated hydraulic suspension system. On-road, this system provides unrivalled steering agility and ride comfort. Off-road, KDSS delivers greater traction and stability. Spring Rate Control Spring Rate Control manages spring characteristics when turning or braking thereby greatly reducing the roll angle and pitch angle for increased passenger comfort. Crawl Control Crawl Control maintains constant and stable low-speed off-road progress. The driver doesn't have to worry about controlling the throttle and brake, and can instead concentrate on steering. New Toyota Touch® 2 Emulator Discover the New Toyota Touch® 2 in more details with this emulator. Capturing the Peaks of Europe On the road with Toyota 4x4 Ambassador @lebackpacker Meet our new Toyota 4x4 Ambassador Toyota hits the road with adventure photographer @lebackpacker 5 astonishing adventures in the Toyota Land Cruiser Discover some of the astonishing achievements that have helped to secure the Land Cruiser its place in automotive history. Flexible and tailored solutions that make driving your Toyota a reality.